A recent report by the consumer advocacy group Public Citizen calls for more oversight of worker safety in the healthcare industry. The report claims the industry remains hazardous with many safety issues unaddressed as a result of insufficient inspections and poor oversight. Workplace safety in the healthcare industry has long been in need of attention. In 2010, healthcare employers reported 653,900 workplace injuries and illnesses. That was approximately 152,000 injuries more than manufacturing, the second most dangerous sector that year. Healthcare workers tend to suffer from specific types of injuries like musculoskeletal injuries. According to OSHA, the rate of work-related musculoskeletal disorders for healthcare personnel, including nursing aides, attendants and orderlies, in 2011 was seven times that for employees in other sectors. Additionally, the healthcare sector seems to suffer a disproportionate number of work-related violent incidents. In 2010, as many as 45 percent of all workplace violence incidents in the country that resulted in lost work days occurred in the healthcare industry. Yet according to Public Citizen, the Occupational Safety and Health Administration has failed to create standards that address healthcare workers’ vulnerability to ergonomic injuries and workplace violence. The risk of injuries and illnesses in this industry is likely to rise, because this is one of the fastest-growing sectors in the American economy. 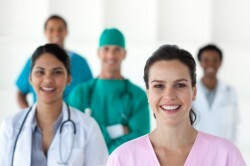 By 2020, the healthcare industry is expected to add 5.6 million jobs to its current workforce of 18.1 million employees. Michael Parsons is an Atlanta workers’ compensation lawyer representing injured workers in the metro Atlanta region and helping them recover the workers’ compensation benefits that they have earned. If you have been injured and need aggressive representation, contact Parsons Law Group today.